Mini Hofner violin bass guitar signed clearly with full signature in black marker by Paul McCartney mounted with 12x16 black and white photo of McCartney on stage playing his Hofner guitar. 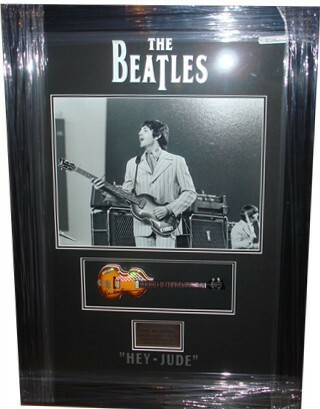 The autograph was obtained at The VIP entrance of John Lennon Airport, Liverpool on 28th July 2006. Double mounted and framed in an effective black frame. with the 'The Beatles' insignia on the top of the mount and 'Hey Jude' on the bottom, with a plate engraved with the relevant details. Thanks to Tim Terry of Superstars in the UK for purchasing the McCartney signed Hofner guitar from www.sportandstarautographs.com, authenticated by www.authenticateit.co.uk.